Posted on March 26, 2019 by Eric Bonnici wrote in Entertainment News. It has 0 Comment. Invisible to the naked eye, ACT Windsor has conjured up the most magical rainbow in existence, placing it over the Capitol Theatre with their mesmerizing production of The Wiz. Last Friday (March 22) Eyes On Windsor was bedazzled by the experience being created inside the theatre, under the rainbow, when the show premiered. Audiences have three more chances to immerse themselves in the non-stop pot-of-gold of a masterpiece, March 29, 30, & 31, before the rainbow fades away. 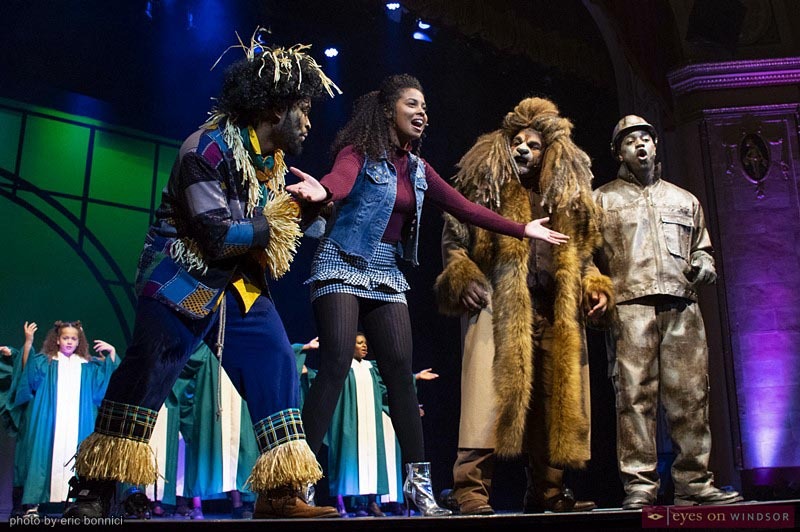 The Wiz, winner of seven Tony Awards including Best Musical and Best Score, is a funky retelling of Frank Baum’s Wonderful Wizard of Oz set in the context of African-American culture, written by William F. Brown. Along with the sensational soul score and lyrics by Charlie Smalls, the production was like nothing Broadway had ever seen when it debuted in 1975. 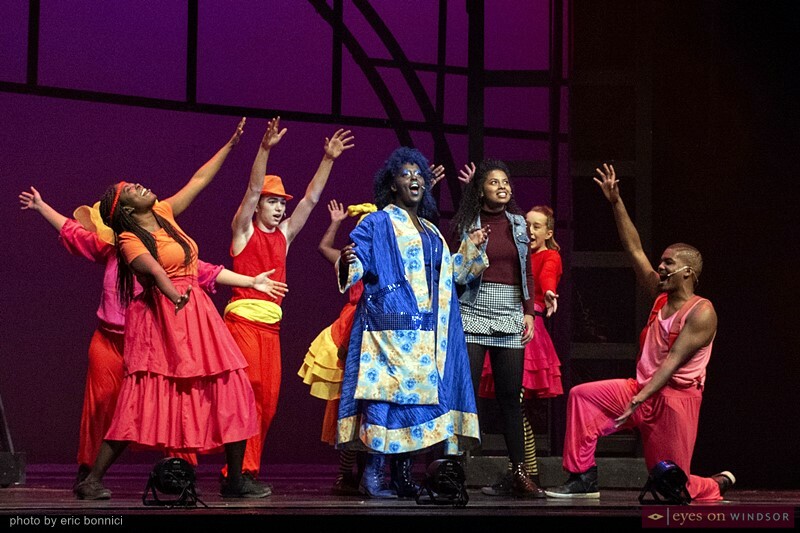 Dorothy (Rochelle Day) with Addaperle (Florine Ndimubandi) and the Munchkins in ACT Windsor’s production of The Wiz at Capitol Theatre Windsor on March 22, 2019. Photo by Eric Bonnici / Eyes On Windsor. Without question, ACT Windsor’s cast and huge production team, full of talented, skilled, recognizable in demand names, is delivering a fabulous tale of “believing in yourself” and “there’s no place like home.” Behind the scenes a long list of names that pulled the show together can be found listed in the program booklet. Everything from lighting, music, and vocals, to set design, costumes, and make up, makes this a must see production. 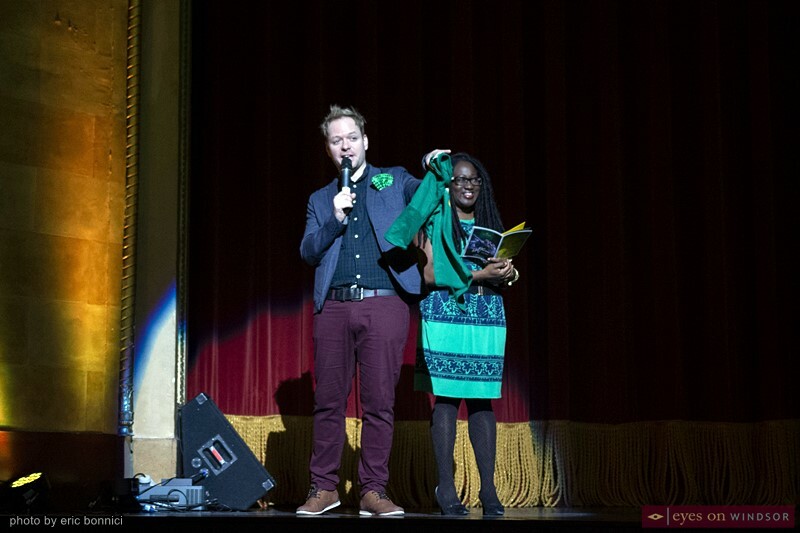 Chris Rabideau and Moya McAlister talk to the audience just before opening night of ACT Windsor’s production of The Wiz at Capitol Theatre Windsor on March 22, 2019. Photo by Eric Bonnici / Eyes On Windsor. ACT Community provides training and performance opportunities for multi-ethnic artists. As ACT Windsor’s promotional material explains, “it operates to enhance the cultural and artistic awareness of the community by providing productions that illuminate diversity and a broad range of cultural experiences. 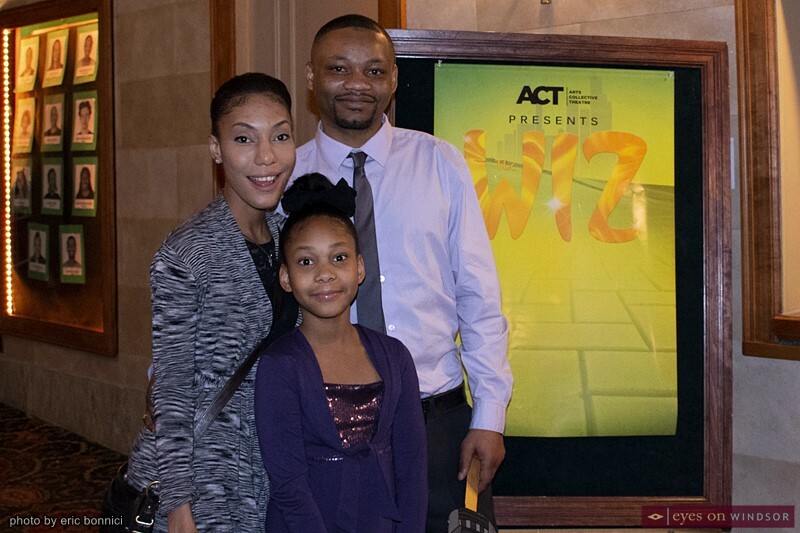 ACT Community strives to educate, enlighten, and entertain a diverse, multicultural audience by using local talent with the emphasis on providing exposure to underserved communities.” Their production of The Wiz, featuring a mainly African-Canadian cast, fits in nicely here. ACT’s production of The Wiz features recognizable characters and brings the audience many memorable moments. Early in ACT I, a tornado scene quickly captivated the audience with storm sound effects provided by the talented pit orchestra, complete with heavy beating drums, complemented by lightning-like lighting effects, and a metaphorical twister brought to life by ensemble cast members. Dressed in silver grey bodysuits, the ensemble wildly run around the stage, coming together to hoist Dorothy above their heads whisking her away to the land of OZ. Dorothy, there are two of theme in this production, is played by Rochelle Day and Joy Mpesha. Rochelle will perform this Friday and Saturday, and Joy on the final performance on Sunday. On opening night Rochelle took on the role and she was adorable. While Rochelle was adorable in her role as Dorothy, her theatrical talent is a fierce total package. She draws the audience in, communicating with a wide range of facial expressions and body language combined with amazing vocals, singing solo a couple of times. First performing theatre in high school, Rochelle is currently back up singer for Windsor based The Family Soul, founded by Soul Brother Mike and including rising star Crissie Cochrane and veteran “rock star” Kelly “Mr. Chill” Hoppe of Canadian blues, reggae rock band, Big Sugar fame. 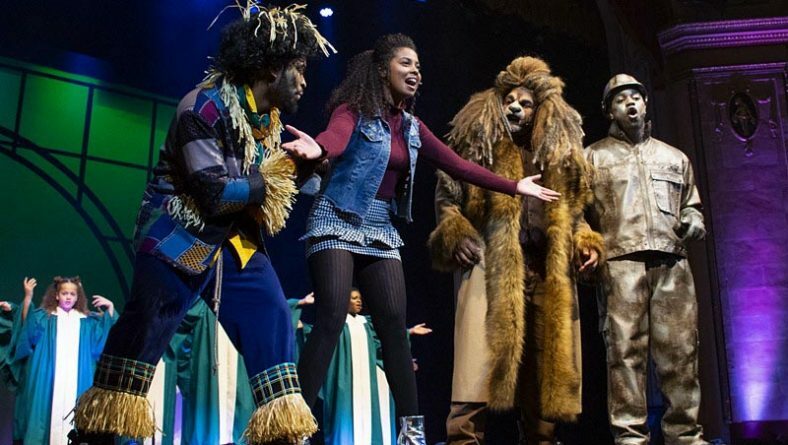 Rochelle Day, as Dorothy in ACT Windsor’s production of The Wiz singing solo at Capitol Theatre Windsor on March 22, 2019. Photo by Eric Bonnici / Eyes On Windsor. Most memorable during the Wiz are Rochelle’s facial expressions. Intense during her solos of “Soon As I Get Home” and “Home”, at other times looks of surprise, confusion, sadness, and many smiling moments. Her scolding of the not so mean Cowardly Lion (Michael Rice), after he scared her, the Tin Man (Joshua S Davis) and Scarecrow (Verzell Page), was fun to watch. 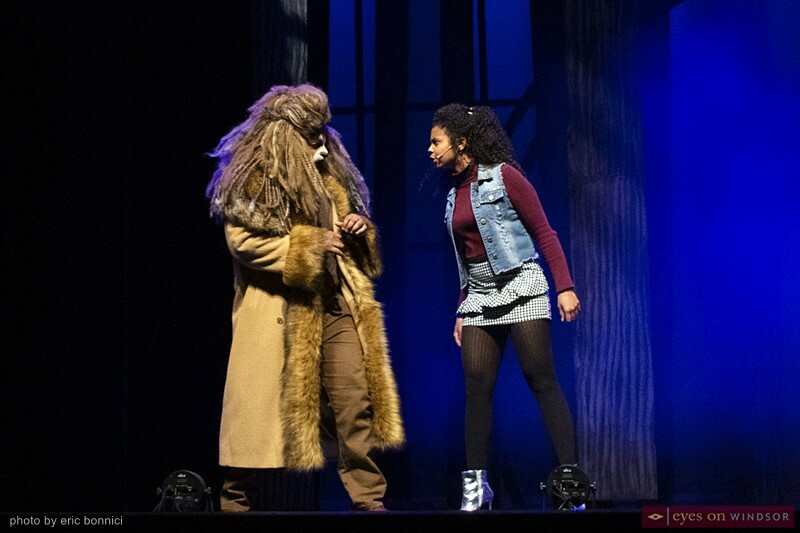 Dorothy (Rochelle Day, right) scolds the Cowardly Lion (Michael Rice) in ACT Windsor’s production of The Wiz at Capitol Theatre Windsor on March 22, 2019. Photo by Eric Bonnici / Eyes On Windsor. Each of these talented lead characters were a pleasure to watch perform. Vizell as the Scarecrow, the first to join Dorothy on her journey to see the Wizard, shined on stage. His background as an artist, multi-instrumentalist, singer, dancer, was clearly evident when the pair began to “Ease On Down The Road”. The tune was sang each time, three in total, Dorothy met one of her counter parts along their journey. Together they sang, danced and offered encouragement as they traveled down the Yellow Brick Road. It was a party for two as Dorothy traveled it with the Scarecrow. 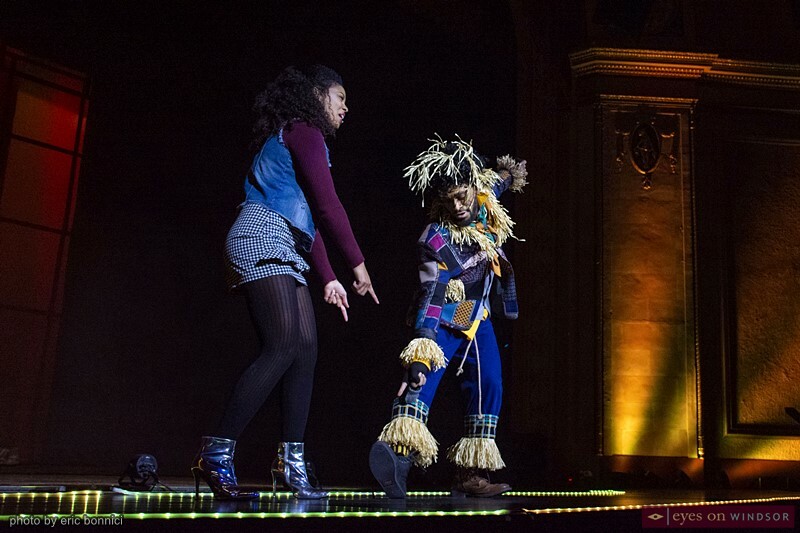 Dorothy (Rochelle Day) and the Scarecrow (Verzell Page) dance as they “Ease On Down The Road” in ACT Windsor’s production of The Wiz at Capitol Theatre Windsor on March 22, 2019. Photo by Eric Bonnici / Eyes On Windsor. 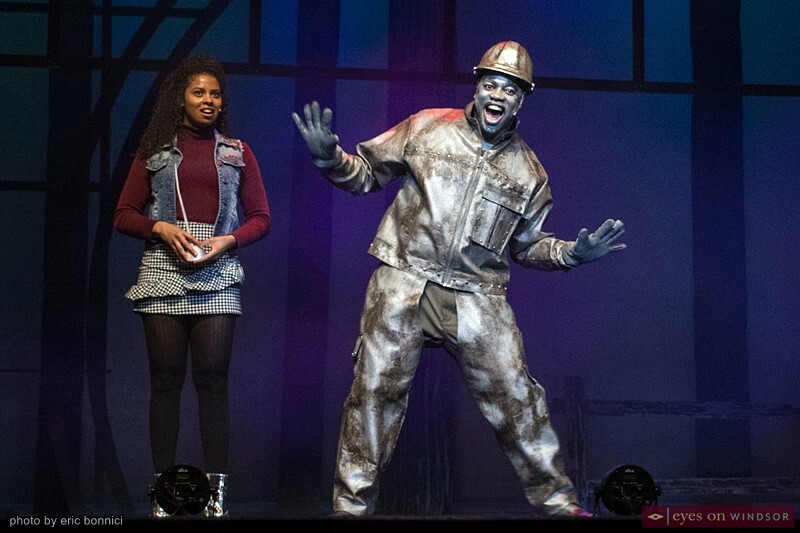 Verzall Page as the Scarecrow in ACT Windsor’s production of The Wiz at Capitol Theatre Windsor on March 22, 2019. Photo by Eric Bonnici / Eyes On Windsor. Next the pair encountered the Tin Man. In this role Joshua S. Davis blew the crowd away. Growing up with a mother who directed the church choir, he grew up listening to music such as, Gospel, Motown, and Earth, Wind & Fire. That soul infusion was evident with his memorable dance moves. 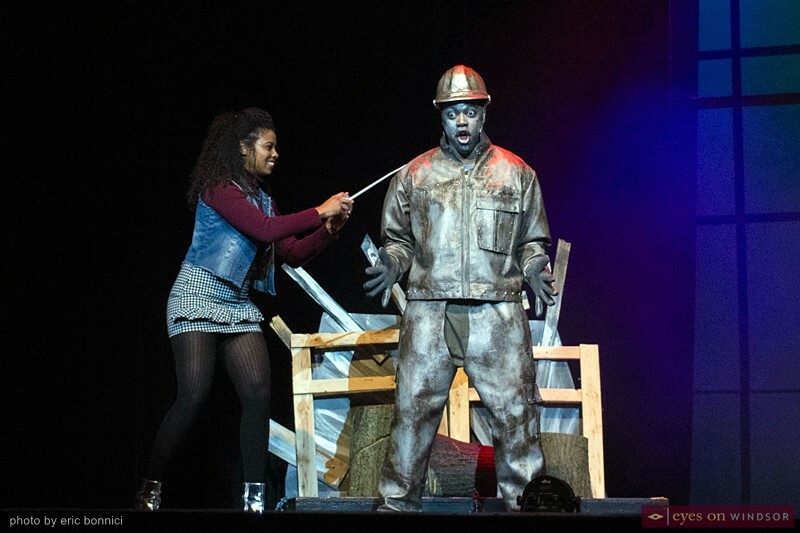 Dorothy (Rochelle Day) and the Tin Man (Joshua S. Davis) performing in ACT Windsor’s production of The Wiz at Capitol Theatre Windsor on March 22, 2019. Photo by Eric Bonnici / Eyes On Windsor. Audience members during intermission of ACT Windsor’s production of The Wiz at Capitol Theatre Windsor on March 22, 2019. Photo by Eric Bonnici / Eyes On Windsor. 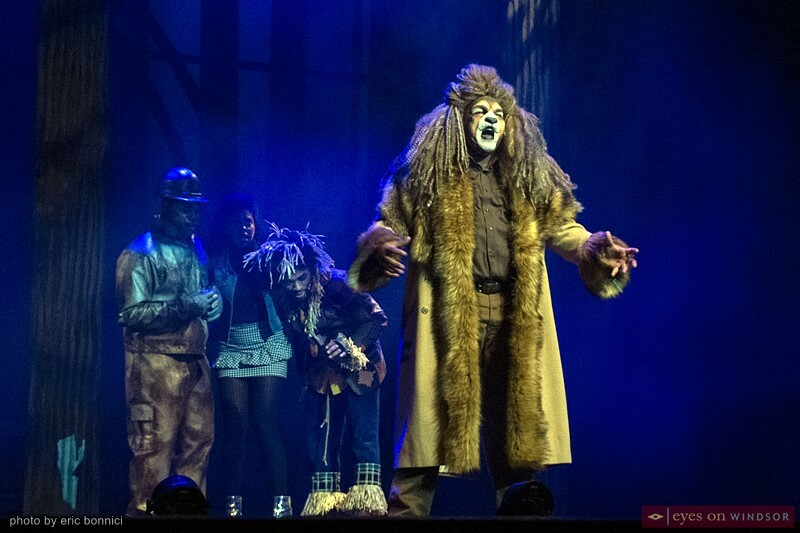 Michael Rice with several impressive roles under his belt including Dream Girls, and lead in Sister Act the musical, did not disappoint in his dream role as the Cowardly Lion. He also took on the role of Uncle Henry. 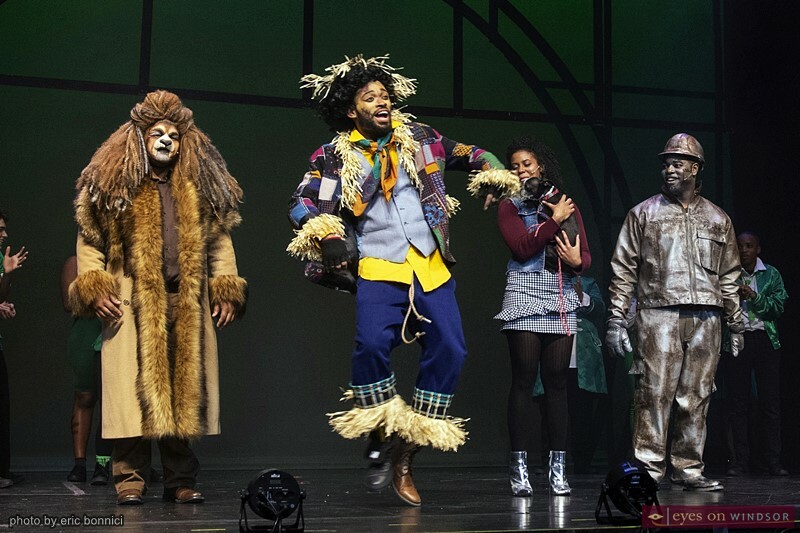 The Cowardly Lion (Michael Rice) performing in ACT Windsor’s production of The Wiz at Capitol Theatre Windsor on March 22, 2019. Photo by Eric Bonnici / Eyes On Windsor. 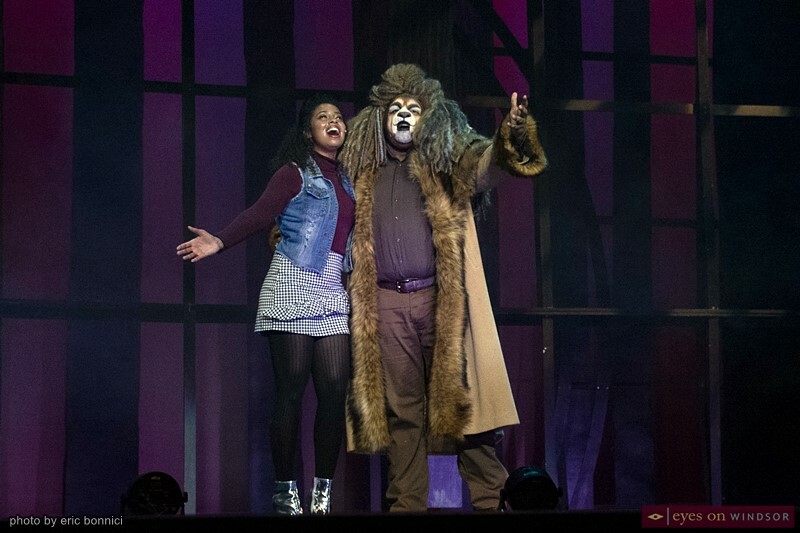 Dorothy (Rochelle Day) and the Cowardly Lion (Michael Rice) performing in ACT Windsor’s production of The Wiz at Capitol Theatre Windsor on March 22, 2019. Photo by Eric Bonnici / Eyes On Windsor. 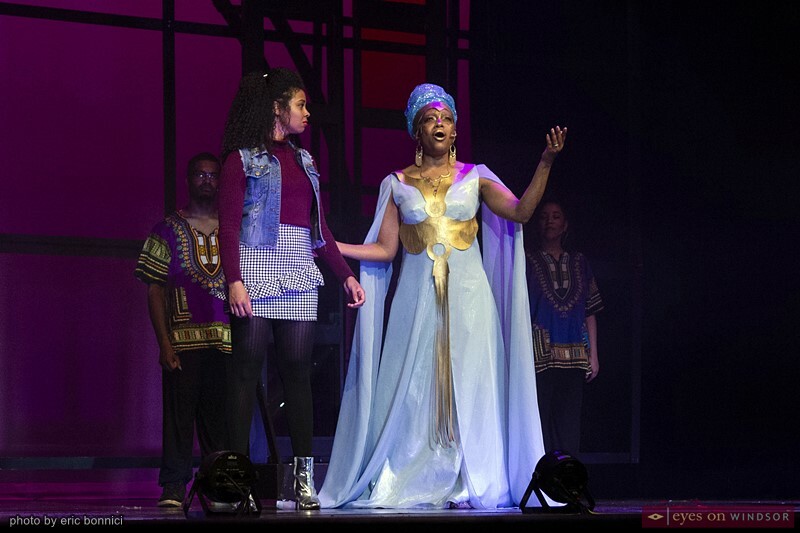 Kianna Porter took on the role of The Wiz. 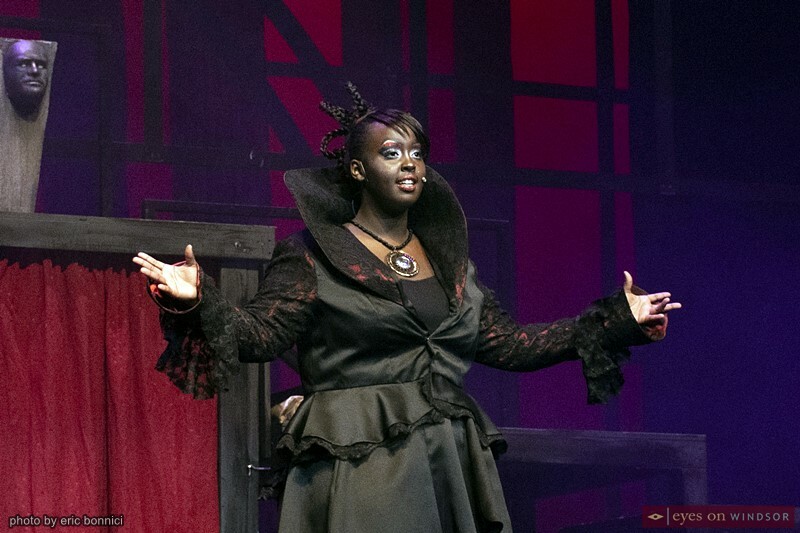 Florine Ndimubandi, the Jekyll / Hyde of the show, took on the roles of Addaperle (Good Witch of the North) and Evillene (Wicked Witch of the West). Cheri McCurdy also played a dual role as Aunt Em and Glinda (Good Witch of the South). All three were a pleasure to watch, intense at times, hilarious at others, but certainly all can perform and bring amazing vocals to the stage. 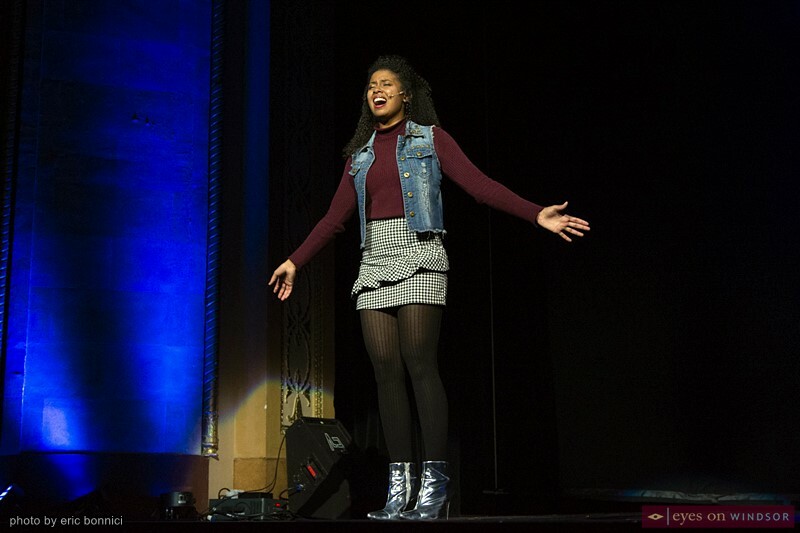 Kianna Porter performing as The Wiz in ACT Windsor’s production of the play of the same name at Capitol Theatre Windsor on March 22, 2019. Photo by Eric Bonnici / Eyes On Windsor. 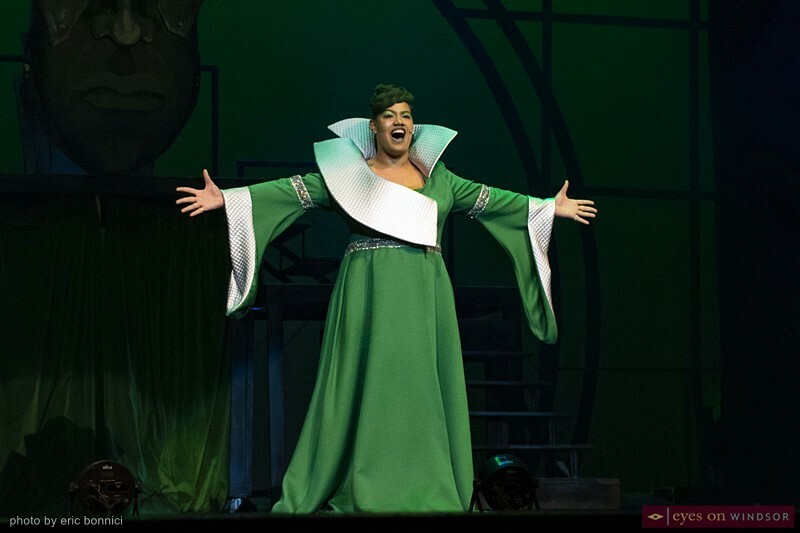 Florine Ndimubandi performing as Evillene (Wicked Witch of The West) in ACT Windsor’s production of The Wiz at Capitol Theatre Windsor on March 22, 2019. Photo by Eric Bonnici / Eyes On Windsor. Dorothy (Rochelle Day) and the Good Witch of The South, Glinda (Cheri McCurdy) performing in ACT Windsor’s production of The Wiz at Capitol Theatre Windsor on March 22, 2019. Photo by Eric Bonnici / Eyes On Windsor. Of course the ensemble were a pleasure to watch and hear as well. The younger cast members were adorable as they sang and danced. Others in the ensemble brought exciting acrobatics to the show. The talent on display and wickedly soulful experience ACT Windsor’s The Wiz is creating, under the rainbow, at downtown Windsor’s Capitol Theatre is absolutely worth “Easing On Down The Road” to see! Final performances take place on March 29, & 30 at 8:00pm, and March 31 at 2:00pm Tickets are $35 Adults, $30 Students/Seniors, $15 Youth (12 & Under). Tickets available online at http://actwindsor.com/tickets-2/ or at the Capitol Theatre Box Office which can be reached by calling 519-973-1238. For more information visit The Wiz event listing on the Eyes On Windsor events calendar.